The fun thing of compiling wishlists is that when you look back, you might be able to tick a lot of the items off your wishlist. One part due to ourselves making plans to reach certain goals (in this case, material, yes I admit it) or loved ones who make them do come true. Remember my wishlist I composed for Edelweiss last year? I'm happy to report back that a lot of them made it into my closet/home/medicine cabinet or bookshelf. 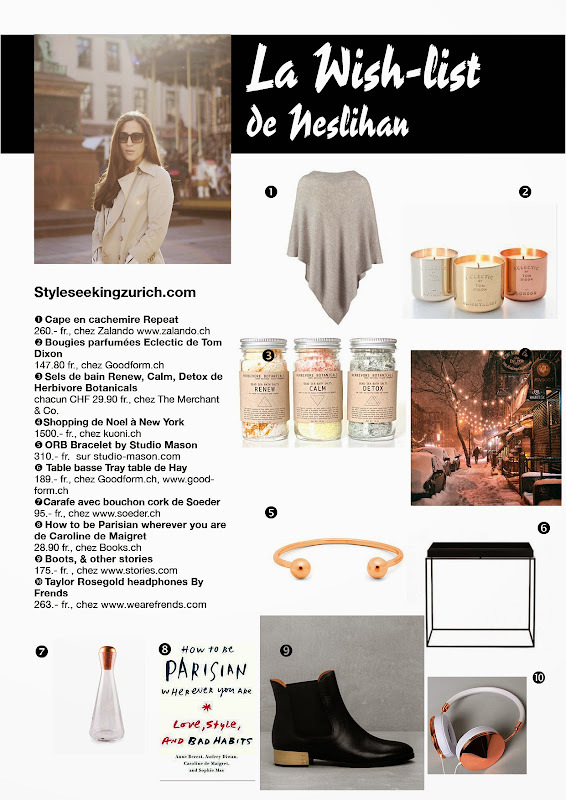 So without further ado I present you my wishlist 2014, filled with things I'm currently coveting. Now this year again readers get to choose their favorite wishlist, and every voter gets the chance to win a gift voucher worth CHF 200.00 to use at Chic Cham (in their shop in Lausanne or online!). The wishlisht with the most votes would get a voucher as well. So if you like mine, I'd appreciate a vote from your part.